Lineage. Constituted as 6 Transport Squadron on 1 Oct 1933. Activated on 14 Oct 1939. Redesignated as: 6 Troop Carrier Squadron on 4 Jul 1942; 6 Troop Carrier Squadron, Heavy, on 21 May 1948; 6 Military Airlift Squadron on 8 Jan 1966. Discontinued, and inactivated, on 8 Jun 1968. Activated on 8 Apr 1970. 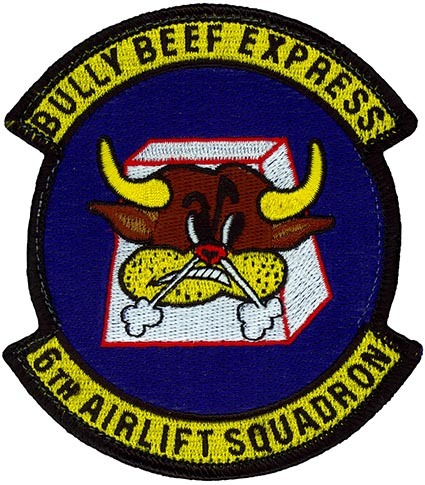 Redesignated as 6 Airlift Squadron on 1 Nov 1991. Assignments. 10 Transport Group, 14 Oct 1939; 60 Transport Group, 1 Dec 1940; 61 Transport Group, 19 May 1941; 315 Transport Group, Mar 1942; 63 Transport (later, 63 Troop Carrier) Group, Jun 1942; 374 Troop Carrier Group, 12 Nov 1942; 403 Troop Carrier Group, 15 May 1946; 374 Troop Carrier Group, 15 Oct 1946; 1503 Air Transport Wing, 18 Nov 1958; 1502 Air Transport Wing, 22 Jun 1964; 61 Military Airlift Wing, 8 Jan 1966-8 Jun 1968. 438 Military Airlift Wing, 8 Apr 1970; 438 Military Airlift Group, 1 Oct 1978; 438 Military Airlift Wing, 1 Jun 1980; 438 Operations Group, 1 Nov 1991; 305 Operations Group, 1 Oct 1994-. Stations. Olmstead Field, PA, 14 Oct 1939; Camp Williams, WI, 23 Mar 1942; Dodd Field, TX, 16-23 Sep 1942; Port Moresby, New Guinea, 13 Oct 1942; Garbutt Field, Australia, 2 Oct 1943; Nadzab, New Guinea, c. 26 Aug 1944; Biak, c. 20 Oct 1944; Tacloban, Leyte, 12 Mar 1945; Nielson Field, Luzon, 1 Jan 1946; Okinawa, 10 Jun 1946; Tachikawa AB, Japan, 13 Apr 1947; Harmon Field, Guam, 1 Dec 1947; Tachikawa AB, Japan, 5 Mar 1949; Hickam AFB, HI, 22 Jun 1964-8 Jun 1968. McGuire AFB, NJ, 8 Apr 1970-. Aircraft. C-33, 1940-1942; C-39, 1940-1942; C-53, 1941-1942; C-47, 1942-1945; C-46, 1945-1947; C-54, 1946-1952; C-124, 1952-1968. C-141, 1970-2004; C-17, 2004-. Operations. Provided aerial transportation in the South, Southwest, and Western Pacific, during World War II and in the Far East during the Korean War. After the Korean War to the present, except inactive period, 1968-1970, provided worldwide air transportation of airborne forces and their equipment and supplies; other general personnel, equipment, and supplies; and air evacuation as directed. Resupplied scientific stations in the Antarctic during Operation Deep Freeze, 1971-1974. Evacuated Vietnamese refugees during the fall of Saigon, Apr-Jun 1975. Supported US forces in Grenada, Oct-Dec 1983; during the invasion of Panama, Dec 1989-Jan 1990; and during the Gulf War, Aug 1990-Mar 1991. Supported combat operations in Afghanistan (2001-) and Iraq (2003-). In 2005, aided humanitarian relief operations for the victims of a tsunami in the Indian Ocean and Hurricane Katrina in Louisiana, Mississippi, and Alabama. Campaign Streamers. World War II: Air Offensive, Japan; Papua; New Guinea; Northern Solomons; Bismarck Archipelago; Western Pacific; Leyte; Luzon; Southern Philippines. Korea: UN Defensive; UN Offensive; CCF Intervention; First UN Counteroffensive; CCF Spring Offensive; UN Summer-Fall Offensive; Second Korean Winter; Korea Summer-Fall, 1952; Third Korean Winter; Korea, Summer 1953. Southwest Asia: Defense of Saudi Arabia; Liberation and Defense of Kuwait. Decorations. Distinguished Unit Citations: Papua, [Oct] 1942-23 Jan 1943; Papua, 12 Nov-22 Dec 1942; Wau, New Guinea, 30 Jan-1 Feb 1943; Korea, 27 Jun-15 Sep 1950. Air Force Outstanding Unit Awards: 1 Jan-31 Dec 1961; 1 Jul 1964-30 Jun 1966; 23 Dec 1965-23 Jan 1966; 1 Jul 1966-30 Jun 1967; 1 Jul 1967- Jun 1968; 1 Jul 1982-30 Jun 1984; 1 Jul 1994-30 Jun 1996; 1 Jul 2000-30 Jun 2001; 1 Jul 2002-30 Jun 2003; 1 Jul 2003-30 Jun 2004; 1 Jul 2004-30 Jun 2006; 1 Jul 2006-30 Jun 2007; 1 Jul 2007-30 Jun 2008. Philippine Presidential Unit Citation (WWII). Republic of Korea Presidential Unit Citation: 1 Jul 1951-27 Jul 1953. Emblem. Approved on 1 Dec 1952. Modified on 22 May 2007.